Whether for business or pleasure, London has a huge amount to offer potential residents. From the leafy streets and high-end boutiques of western enclaves such as Knightsbridge and Notting Hill to the edgier East end or the City with its proximity to London’s financial hubs and superyacht marinas, wherever you choose to buy you won’t be disappointed. Plus, with an abundance of new luxury properties under construction and the pound currently cheaper against the dollar and Euro, there’s never been a better time to invest. Here’s our guide to the hottest London addresses to buy in now… The penthouse at South Quay Plaza Currently in the final stages of development by Berkeley Homes, the Foster + Partners-designed South Quay Plaza offers everything from urban pied-à-terres to family-sized apartments just minutes from the commercial and leisure hub of Canary Wharf. Having already proved popular with buyers both at home and overseas, just one of the development's three-bedroom penthouses is still available. The 64th floor apartment spans 1,236 square feet and offers three bedrooms and three bathrooms as well as an open plan living, kitchen and dining area with floor-to-ceiling windows making the most of stunning views across Canary Wharf, the Thames and beyond. While being sold unfurnished, interior designer Dara Huang has created a bespoke dressing scheme for the penthouse utilising curved shapes, natural fabrics and neutral, alongside high-end pieces by Vladimir Kagan and DHLux, to create an inviting, tranquil atmosphere. Residents at South Quay Plaza will also gain membership to the Quay Club which grants access to a 56th floor resident's lounge, bar and large terrace as well as a health club boating a 20 metre swimming pool, vitality pool, hot pool, sauna, steam room and wellness facilities. The South Quay Plaza penthouse is listed for sale for £2,875,000 with Berkeley Homes. Currently in the final stages of development by Berkeley Homes, the Foster + Partners-designed South Quay Plaza offers everything from urban pied-à-terres to family-sized apartments just minutes from the commercial and leisure hub of Canary Wharf. Having already proved popular with buyers both at home and overseas, just one of the development's three-bedroom penthouses is still available. The 64th floor apartment spans 1,236 square feet and offers three bedrooms and three bathrooms as well as an open plan living, kitchen and dining area with floor-to-ceiling windows making the most of stunning views across Canary Wharf, the Thames and beyond. While being sold unfurnished, interior designer Dara Huang has created a bespoke dressing scheme for the penthouse utilising curved shapes, natural fabrics and neutral, alongside high-end pieces by Vladimir Kagan and DHLux, to create an inviting, tranquil atmosphere. Residents at South Quay Plaza will also gain membership to the Quay Club which grants access to a 56th floor resident's lounge, bar and large terrace as well as a health club boating a 20 metre swimming pool, vitality pool, hot pool, sauna, steam room and wellness facilities. The South Quay Plaza penthouse is listed for sale for £2,875,000 with Berkeley Homes. Located between Sloane Square and Knightsbridge, Chelsea Barracks represents a major new development in West London set over 12.8 acres and encompassing seven new residential squares with a host of public amenities. The first three squares are due for completion in 2019 with three property types - residence, penthouses and townhouses - on offer. The most luxurious of these are undoubtedly the townhouses which have been designed in reference to their grand Georgian predecessors to boast large living areas set over four storeys, fine British craftsmanship and flexible layouts to cater to all types of owners. Residents will also have access to range a high-end amenities including a beauty salon and gym with training studios designed by Goddard Littlefair, a business suite with board rooms, swimming pool, spa, private screening room, billiard room, a 24-hour hotel-style concierge and valet parking. Townhouses at Chelsea Barracks start at £37 million. Located between Sloane Square and Knightsbridge, Chelsea Barracks represents a major new development in West London set over 12.8 acres and encompassing seven new residential squares with a host of public amenities. The first three squares are due for completion in 2019 with three property types - residence, penthouses and townhouses - on offer. The most luxurious of these are undoubtedly the townhouses which have been designed in reference to their grand Georgian predecessors to boast large living areas set over four storeys, fine British craftsmanship and flexible layouts to cater to all types of owners. Residents will also have access to range a high-end amenities including a beauty salon and gym with training studios designed by Goddard Littlefair, a business suite with board rooms, swimming pool, spa, private screening room, billiard room, a 24-hour hotel-style concierge and valet parking. Townhouses at Chelsea Barracks start at £37 million. If you are a fan of boats with oars as well as those with sails, it’s hard to think of a much more enticing proposition than the Beach House. 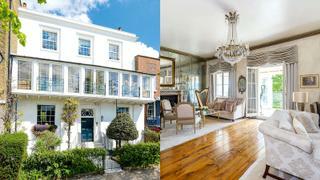 Sitting just metres from the towering green pillars of Hammersmith Bridge, this Georgian property offers a prime viewing spot for the annual Boat Race (the bridge is often a crucial point in the duel between Oxford and Cambridge universities). As well as its viewing credentials, the Grade II listed double-fronted family house has six bedrooms and five bathrooms. It was originally a boat house situated right on the river’s edge before the tow path was laid and the initial structure became part of the basement of the current house when it was built around 1760. It is still packed with period features, lovingly restored, including fruitwood banisters and mouldings. At the rear of the property sit mature landscaped gardens with a hot tub. To the front of the house, across the walkway, is a private river pier, where you can moor a boat for direct access to the Thames. Beach House is listed for sale for £8,750,000 with Savills. If you are a fan of boats with oars as well as those with sails, it’s hard to think of a much more enticing proposition than the Beach House. Sitting just metres from the towering green pillars of Hammersmith Bridge, this Georgian property offers a prime viewing spot for the annual Boat Race (the bridge is often a crucial point in the duel between Oxford and Cambridge universities). As well as its viewing credentials, the Grade II listed double-fronted family house has six bedrooms and five bathrooms. It was originally a boat house situated right on the river’s edge before the tow path was laid and the initial structure became part of the basement of the current house when it was built around 1760. It is still packed with period features, lovingly restored, including fruitwood banisters and mouldings. At the rear of the property sit mature landscaped gardens with a hot tub. To the front of the house, across the walkway, is a private river pier, where you can moor a boat for direct access to the Thames. Beach House is listed for sale for £8,750,000 with Savills. Sitting right in the heart of the Establishment, just a stone’s throw from the River Thames, the resplendent Mansion House has a rich political history. The property, which was designed by architect Horace Field, was built in 1905 and initially served as the London office of the North Eastern Railway Company. In 1982 the Liberal Democrats (then known as the Social Democratic Party) moved in – and they didn’t pack up their filing cabinets until 2011. It was at this stage that London-based luxury developer Saigol DDC stepped in to transform the building into a seven-bedroom family home, while maintaining its historical charm. The renovation, aided by craftsmen who had previously worked on Windsor Castle and the Palace of Westminster, incorporates a host of striking period features, such as a sweeping central staircase and ornate gilt cupola. Despite being Grade II listed, it is packed with modern amenities including an eight-person lift and a wellness area complete with a 10 metre swimming pool. As well as its dramatic interiors, Mansion House, which is 15 metres wide, has an Italian garden and roof terrace, which offers views of Big Ben, the House of Lords and Westminster Abbey. Mansion House is listed for sale for £29.95 million with Knight Frank. Sitting right in the heart of the Establishment, just a stone’s throw from the River Thames, the resplendent Mansion House has a rich political history. The property, which was designed by architect Horace Field, was built in 1905 and initially served as the London office of the North Eastern Railway Company. In 1982 the Liberal Democrats (then known as the Social Democratic Party) moved in – and they didn’t pack up their filing cabinets until 2011. It was at this stage that London-based luxury developer Saigol DDC stepped in to transform the building into a seven-bedroom family home, while maintaining its historical charm. The renovation, aided by craftsmen who had previously worked on Windsor Castle and the Palace of Westminster, incorporates a host of striking period features, such as a sweeping central staircase and ornate gilt cupola. Despite being Grade II listed, it is packed with modern amenities including an eight-person lift and a wellness area complete with a 10 metre swimming pool. As well as its dramatic interiors, Mansion House, which is 15 metres wide, has an Italian garden and roof terrace, which offers views of Big Ben, the House of Lords and Westminster Abbey. 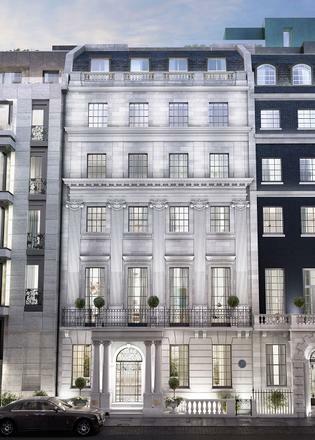 Mansion House is listed for sale for £29.95 million with Knight Frank. A collection of luxury apartments by EcoWorld Ballymore, Wardian London combines modern architecture with innovative landscaping in one of the city’s most lucrative business districts. Composed of two residential towers, the buildings themselves, designed by Glenn Howells Architects, will rise to 50 and 55 storeys over South Dock, with unrivalled views over Canary Wharf and the City. Wardian London’s penthouses, the development’s most luxurious residences available in two or three bedroom duplex configurations, offer residents the ultimate oasis from the hustle and bustle of the city. Interiors by a specialist team of designers draw inspiration from the development’s unique eco-concept and the apartment's private sky garden. Using an earthy colour palette to give the decor an artisan’s touch, unlacquered marble, stone and brass, as well as organic timber are used in abundance throughout the open plan living areas and spacious bedrooms. All Wardian London residents will also have access to The Wardian Club and its exclusive facilities, which include a 25 metre open air swimming pool, gym, cinema, business lounge, two restaurants, a vibrant rooftop sky observatory and a 24 hour concierge service. Penthouses at Wardian London are listed with price on request with EcoWorld Ballymore. A collection of luxury apartments by EcoWorld Ballymore, Wardian London combines modern architecture with innovative landscaping in one of the city’s most lucrative business districts. Composed of two residential towers, the buildings themselves, designed by Glenn Howells Architects, will rise to 50 and 55 storeys over South Dock, with unrivalled views over Canary Wharf and the City. Wardian London’s penthouses, the development’s most luxurious residences available in two or three bedroom duplex configurations, offer residents the ultimate oasis from the hustle and bustle of the city. Interiors by a specialist team of designers draw inspiration from the development’s unique eco-concept and the apartment's private sky garden. Using an earthy colour palette to give the decor an artisan’s touch, unlacquered marble, stone and brass, as well as organic timber are used in abundance throughout the open plan living areas and spacious bedrooms. All Wardian London residents will also have access to The Wardian Club and its exclusive facilities, which include a 25 metre open air swimming pool, gym, cinema, business lounge, two restaurants, a vibrant rooftop sky observatory and a 24 hour concierge service. 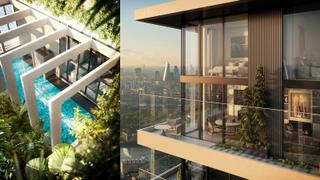 Penthouses at Wardian London are listed with price on request with EcoWorld Ballymore. The final and most exclusive phase of One Park Drive, a luxurious 58-storey residential building within Canary Wharf's newest development Wood Wharf, the Sky Lofts are located on the 32nd floor offering panoramic views across London. Just three Sky Lofts will be made available, each boasting up to 1,300 square feet of exterior space and putting an emphasis on seamless indoor/outdoor living thanks to floor to ceiling windows and the building's innovative cylindrical architecture by Herzog & de Meuron. Inside, each Sky Loft will offer separate kitchen and living areas as well as spacious bedrooms and fully quipped bathrooms. Residents at One Park Drive will also have access to a host of amenities including a concierge, library, gym, 20-metre swimming pool, steam room and sauna. 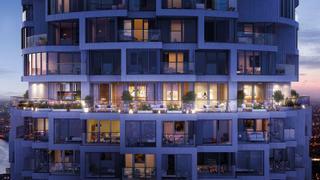 Sky Lofts at One Park Drive start from £2,750,000 with Canary Wharf Group. 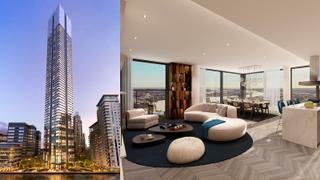 The final and most exclusive phase of One Park Drive, a luxurious 58-storey residential building within Canary Wharf's newest development Wood Wharf, the Sky Lofts are located on the 32nd floor offering panoramic views across London. Just three Sky Lofts will be made available, each boasting up to 1,300 square feet of exterior space and putting an emphasis on seamless indoor/outdoor living thanks to floor to ceiling windows and the building's innovative cylindrical architecture by Herzog & de Meuron. Inside, each Sky Loft will offer separate kitchen and living areas as well as spacious bedrooms and fully quipped bathrooms. Residents at One Park Drive will also have access to a host of amenities including a concierge, library, gym, 20-metre swimming pool, steam room and sauna. 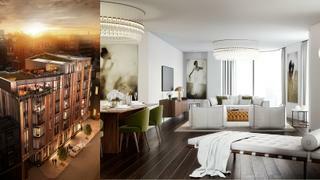 Sky Lofts at One Park Drive start from £2,750,000 with Canary Wharf Group. Home to some of the world’s finest hotels, most exclusive shops and famous streets, there are few finer places to live in London than the iconic Mayfair neighbourhood. However, with space here in such high demand, it’s not often that large properties come to market making the Mayfair Park Residences an almost unique opportunity to buy family-sized homes in this desirable district. Overlooking Hyde Park and with in-house amenities provided by the adjoining Dorchester Collection 45 Park Lane hotel, of particular note is the three-bed, four-bath Townhouse 01 which boasts a Grade II listed façade and modern interiors. 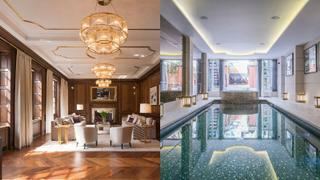 Townhouse 01 at Mayfair Park Residences is listed for £13,350,000 with Clivedale London. Home to some of the world’s finest hotels, most exclusive shops and famous streets, there are few finer places to live in London than the iconic Mayfair neighbourhood. However, with space here in such high demand, it’s not often that large properties come to market making the Mayfair Park Residences an almost unique opportunity to buy family-sized homes in this desirable district. Overlooking Hyde Park and with in-house amenities provided by the adjoining Dorchester Collection 45 Park Lane hotel, of particular note is the three-bed, four-bath Townhouse 01 which boasts a Grade II listed façade and modern interiors. 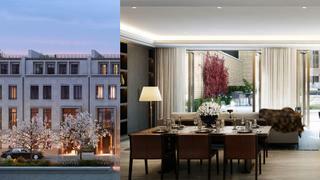 Townhouse 01 at Mayfair Park Residences is listed for £13,350,000 with Clivedale London. Straddling the border between Marylebone and Mayfair, the Mansion occupies a prime position just minutes from Oxford Street, Bond Street, Hyde Park and Buckingham Palace. Designed by DSDHA with interiors by Arney Fender Katsalidis, the building houses 23 single-level and duplex apartments offering a modern take on the area’s traditional red brick buildings. The development's top end offering comes in the form of two beautiful penthouses with large open plan living spaces and floor-to-ceiling windows while all residents will have access to 6,500 square feet of amenities including a residents’ lounge overlooking a sunken garden, spa and fitness centre with sauna, steam room and treatment room and 25-metre swimming pool as well as a 24-hour concierge, access to a chauffeur-driven Bentley, valet parking and hotel-style amenities from a range of external partners. The Mansion apartments have been developed by Clivedale London and are listed for sale with Savills and CBRE with prices for a two-bedroom residence starting at £5,300,000. Straddling the border between Marylebone and Mayfair, the Mansion occupies a prime position just minutes from Oxford Street, Bond Street, Hyde Park and Buckingham Palace. Designed by DSDHA with interiors by Arney Fender Katsalidis, the building houses 23 single-level and duplex apartments offering a modern take on the area’s traditional red brick buildings. The development's top end offering comes in the form of two beautiful penthouses with large open plan living spaces and floor-to-ceiling windows while all residents will have access to 6,500 square feet of amenities including a residents’ lounge overlooking a sunken garden, spa and fitness centre with sauna, steam room and treatment room and 25-metre swimming pool as well as a 24-hour concierge, access to a chauffeur-driven Bentley, valet parking and hotel-style amenities from a range of external partners. The Mansion apartments have been developed by Clivedale London and are listed for sale with Savills and CBRE with prices for a two-bedroom residence starting at £5,300,000.